Simon Cowell, the international media mogul known for straight talk and chilling temperament, is said to have lost his cool when his partner, Lauren Silverman, called on Valentine’s Day to say she was in labor with their son. Cowell did not plan to watch the birth but wanted to be by Silverman’s side when his son was born and he was 15 hours away. He made it just in time. When Cowell arrived in New York, Silverman was in the advanced stages of labor. Their son was born at 5:45 PM on Valentine’s Day, with daddy at hand. 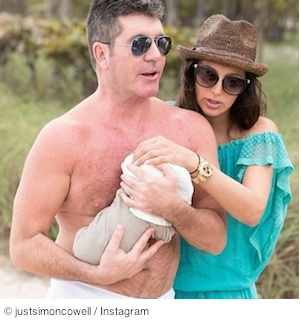 The baby was named Eric in honor of Cowell’s late father. Silverman, who already has one son, had a difficult labor this time around but Cowell knew she meant it when she said the baby was on the way. Trusting that “she knows the signs,” Cowell, 54, took off for New York immediately upon hearing the news. In the days following Eric’s birth, the notorious judge of the Pop Idol / American Idol franchise is said to idolize his son. “I never knew how much love and pride I would feel,” tweeted the delighted dad. In spite of his elation, however, Cowell vows he will never change a nappie (diaper). Cowell’s father, Eric Selig Phillip Cowel, Sr., was a music industry executive and estate agent developer in Elstree, Hertfordshire, England, where Cowell grew up. He came to his son’s rescue when one of the younger Cowell’s first attempts in the entertainment industry didn’t go as well as it might have. Cowell’s famous personality was already in full development, apparently, when he was hired as a runner for Stanley Kubrick during production of the movie, The Shining. It soon became obvious young Cowell was not getting along too well with his bosses and coworkers so his father offered a way out. The elder Cowell was an executive at one of the leading companies in the recording industry, EMI Music Publishing, and he helped his son land a job in the company’s mail room. The relationship between Cowell and Silverman came to light in early 2013, as her bitter and highly publicized divorce became headline fodder. Before their affair was known, Silverman’s husband, Andrew, was Cowell’s best friend. The divorce was settled out of court in August 2013. Cowell has homes in London and Los Angeles. Source: “Simon Cowell faced race to make son’s birth.” TVNZ OneNews. Television New Zealand Limited. Feb 16, 2014. Web. Feb 19, 2014.